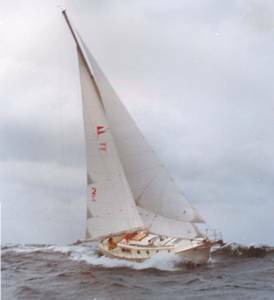 The Kaiser Gale Force 34' was first designed and built by my Father, John "Rex" Kaiser, in 1974. His boatshop is still located on the banks of the Christina River, in downtown Wilmington, Delaware. 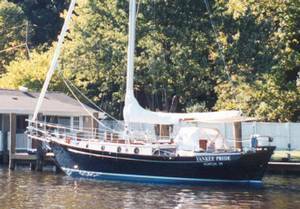 From 1974 till 1985, he built 33 semi-custom Gale Force 34' models. Each owner's Gale Force was hand crafted into a beautiful showpiece, without a limit for perfection. In his words, "Built the way good boats ought to be, without compromise of design, standards or price". Since conception, the Gale Force has been known as one of the finest offshore cruising yachts available. 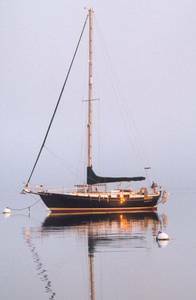 Each owner has followed their dreams to either cruise the U.S. east and west coast, the shallow areas of the Chesapeake, coral reefs of the Florida Keys and Bahamas to the rocky shorelines of New England and Maine. 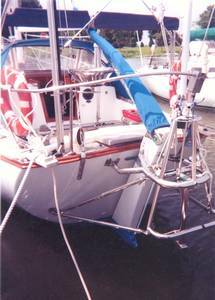 Other owners have sailed their Gale Force 34's to other distant destinations around the world. 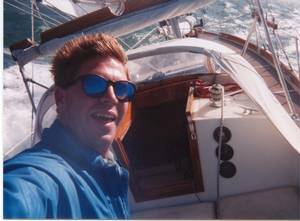 The Kaiser GALE FORCE's are go anywhere, true bluewater sailing yachts that have stood the test of time. 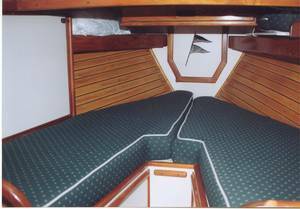 When offshore...the Gale Force has a very stable ability, easily steered and manuvered in most all weather and sea conditions. Her full keel gives fantastic directional control. After a full days run or an extended voyage....the Gale Force is very comfortable at anchor. 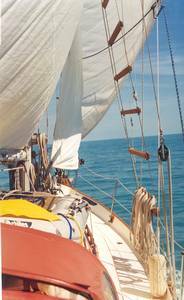 Her cutter rig makes sail handling a breeze! 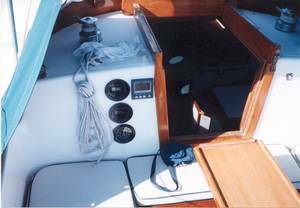 Every Gale Force has a standard aft facing navigation station. 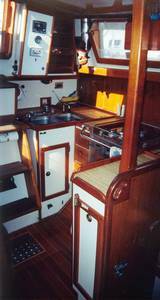 Each custom Galley has been very thoughtfully designed by Claire Kaiser...for being the most functional and comfortable for cooking while sailing or on the hook. The Gale Force main salons are beautifully detailed and finished. We use Butternut, ash and teak...hand finished and stick built...every part has been cut and dry fitted...then taken back out for finishing and reinstalled....our interiors averaged 8,000 man hours. 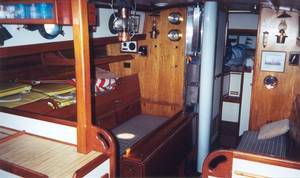 Our V-berths are large and very comfortable...most models include a fold down tool and work area. The engine room is a fantastically accessable area. There is a molded in drip pan with an oil evacuation drain. The area is accessable through the lower steps that remove. Also, the upper step removes and reveals the upper half of the engine. The GF came standard with a 30 Hp Westerbeke and had optional Westerbeke 40 and later Yanmar 44 and 50 HP options. 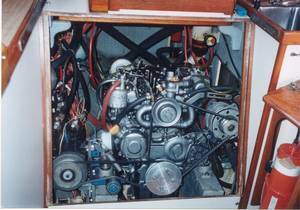 The stuffing box and Transmission is accessable through the sail locker. 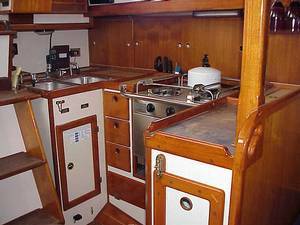 The Galley also has very large countertops, deep stainless sinks and a wonderful cooking layout for the finest ease of preparation. The end of the counter-top has a unique built in trash storage that is placed perfectly! 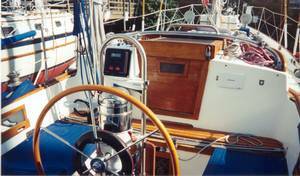 The outboard rudder is a essencial design feature to the Gale Force. It makes the yacht steer easily, due to It's size. The external windvane is an offshore option that works in most all sea conditions. 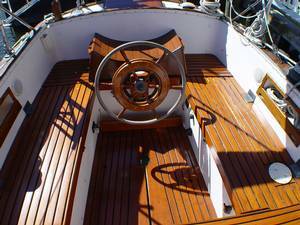 Our cockpits have wonderful teak cocktail tables along with deep coverage dodgers and sun awnings. Note the cockpit winches for the main and staysail. 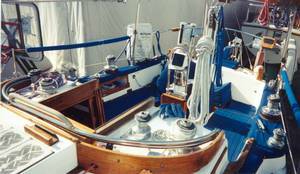 Genoa winches are just outboard of the helmsman for singlehandling ease. Her optional cable controlled Edson wheel gives the cockpit an extra level of control and comfort. Any Gale Force can have this conversion. 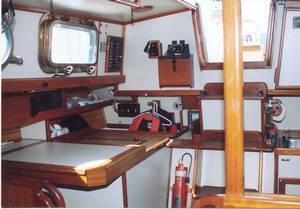 Combinations include rack and pinion with half moon helm seat, Edson cable/wheel steering or direct tiller to rudder steering. Note her spray-rails on the coach top, that keeps heavy deck wash from battering the crew. 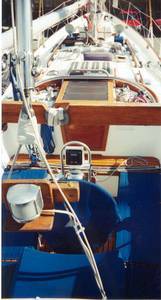 The sea hood allows a great mounting location for the solar panel. Nothing can measure the feeling of stability and saftey of the Gale Force offshore. I singlehand all the time and feel comfortable knowing that so much thought has gone into her design and outfitting. My father has done a fantastic job thinking through this beautiful design. 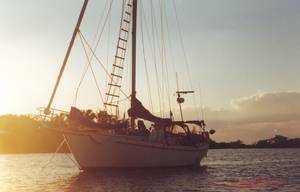 To own a Gale Force is one of life's the most rewarding experiences...I look forward to talking with you about owning and sailing your own GALE FORCE! Please take a close look at my web site for my current offering. 443-223-7864 or 410-923-1400. "Enjoy and respect our oceans"